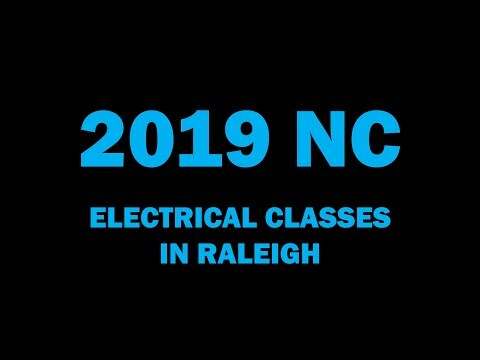 RALEIGH, N.C., Feb. 12, 2019 /PRNewswire/ — The 10,000 Licensed North Carolina Electricians who want to renew their licenses can now grab a seat at the most sought-after class of 2019. SEATING IS VERY LIMITED. Anyone who is anyone in the Electrical Trade in NC knows Don. Now they can learn from one of the Masters, save a lot of time and money, and Renew their Electrical License for years. One Time Only. Don’t Miss the $100 NC Classroom Event with Don Hursey. The $100 Classroom CE Event with Don Hursey! Get 16 Hours For $100. NC Electrical Continuing Education for North Carolina Electricians’ Electrical License Renewal. ElectricalLicenseRenewal.com is Approved for ALL North Carolina Electricians and is Officially Approved by the North Carolina State Board of Examiners (NCBEEC) and by the North Carolina Department of Insurance (NCDOI) for Electrical License Renewal. The Instructor: Don Hursey retired as Senior Electrical Inspector after 33 years of service. Don is the Most Requested Electrical Teacher in North Carolina. In Seminar 1 the attendees will gain an understanding of working space, dedicated equipment space, room ratings, entry and exit requirements, panic hardware, and panelboard retrofit kit installation. In Seminar 2, the topics discussed will include the NEC requirements for MOE illumination including the source of supply, unit equipment, circuit arrangement, switching, power limited circuits, limited energy wiring methods, circuit separation and Power over Ethernet (POE). This event is for North Carolina Electricians and is Officially Approved by the North Carolina State Board of Examiners (NCBEEC) and by the North Carolina Department of Insurance (NCDOI) for Electrical License Renewal. The $100 NC Classroom Electrical License Renewal Event with Don Hursey. The North Carolina State Board of Examiners of Electrical Contractors requires that a licensee complete 8 hours of continuing education for U, I and L license types each year. FOUR (4) HOURS PER YEAR MUST BE CLASSROOM CREDIT TYPE. Up to 24 hours can be taken during one renewal cycle and used for later renewals. The renewal deadline in North Carolina is the date the license was issued, every year. Yes! We Are Approved by the North Carolina State Board of Examiners of Electrical Contractors for North Carolina Electricians’ License Renewal. *A Discount Code Will Be Provided During Class for The FREE Online Courses. Check in starts at 7:45 AM and CLASSES START RIGHT AWAY AT 8:00 AM / 1:00 PM. 1 Hour for Lunch If Attending Full Day. From 12 Noon – 1 PM.